... showcasing the work of Garth Hoets - potter, sculptor, craftsman, artist and teacher. You are invited to view Garth's original and unique works, decorated and hand-painted with glazes prior to firing. Garth's work is functional and decorative, he produces both electric-fired stoneware and gas-fired reduction stoneware. 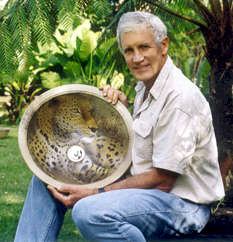 Decorative inspiration and stimulation for most pieces, whether abstract or realistic, come from aspects of nature, and in particular from the African bush and wildlife that Garth so loves. Please browse these pages to see examples of Garth's handcrafted creations. Not only does Garth offer a wide range of pieces for sale, he also does work on commission, and he teaches pottery classes. Pottery lessons are offered at various times throughout the week. Garth will welcome you to his classes whether you're a beginner or an experienced potter. Copyright © 2011/12/13/14. All Rights Reserved. Updated: 26 August 2014.